1805 Birth of Charles Frederick Field, said by some accounts to be the "Son of a publican in Chelsea"
18?? -- Field joins the Bow-Street Runners. Dickens seems to have believed that Field started with the Runners, but there is no external evidence of his having done so. 1829 (September) Sergeant, E Division (Holborn). Field's height at his entrance to the force was stated to be 5'10". 1837 On 26th May, Field involved in the case of a murdered prostitute, Eliza Grimwood, at 12 Wellington Terrace, Waterloo. He investigated a certain Mr. Hubbard, the dead woman's cousin, a bricklayer who lived partly on Eliza's earnings. Despite commendable persistence and some progress, was unable to bring the case to a successful conclusion. 1842: Detective Division founded with Inspector Nicholas Pierce as its first Chief. Field joins as one of its first detectives. 1843? Inspector Joseph Shackell takes over from Pierce. 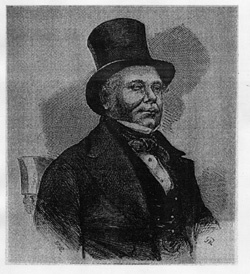 1846 Field becomes Chief of the Detective Branch, taking over from Shackell. 1851 -- Field is credited with the apprehension of Charles Gill, who was charged with threatening the life of Lord John Russell. The basis of this case was a letter written by Gill, in which he threatened to "fire an ounce of powder into the skull of his Lordship, at no. 6 Downing-street." Mr. Gill was apparently unhappy because some proposals of his had been ignored by the government. Field, in company with Sergeant Thornton of the Detective Police, arrested Gill at midnight on 12 February 1851. After a trial the following day before Justice Henry at Bow-street, he was required to post £100 surety against his repeating the offence within the next twelvemonth. See the News of the World, 16 February 1851. 1851 Field provides security at a performance of Lord Lytton's play "Not So Bad as We Seem," during a benefit hosted by the Duke of Devonshire. He was engaged by Dickens, who had been given to understand by Lord Lytton that his estranged wife, Rosina, had threatened to disrupt the play, either (by one account) posing as an orange-seller and pelting the stage with fruit, or (by another) planning to throw rotten eggs at the Queen, who was to attend the performance. Dickens, in a letter to the Duke of 9 May, 1851, stated that "I have spoken to Inspector Field of the Detective Police (one of my Night-Guides, and wholly devoted) and have requested him to attend . . . on both nights in plain clothes. He is discretion itself, and accustomed to the most delicate missions." 1851 (14 June) Field appears as the title character in Dickens's bit of Victorian journalism-verité, "On Duty With Inspector Field" which appears as the lead article in Household Words. 1852 (6 December) -- Retires, and opens a Private Inquiry bureau. According to some reports, Dickens subscribed £300 to a testimonial. 1852-1853 -- Serial publication of Dickens's novel Bleak House. Field is widely regarded as the basis for Dickens's character of "Inspector Bucket" in this novel. 1855 (November) Field involved as an investigator in the notorious Palmer poisoning case. Restoration of Pension: Mr. Field, Late Inspector in the Metropolitan Police, the payment of whose superannnuation allowance has been stopped (Police Orders, 17th August, 1861), on account of his conduct with the Private Inquiry Office, has given assurance to the Secretary of State that no cause for the future shall be given for disapprobation, and that he will take steps at once to remove any impression that may exist that he acts in any connexion with the Government. The matter came up again in 1865, but the Home Secretary, Sir George Grey, wrote to the Commissioner that in these circumstances, he did not take away Field's pension, "on the understanding that he is not again in any way connected with that office"
With thanks to Alan Moss for contributing additional information on Field's career.